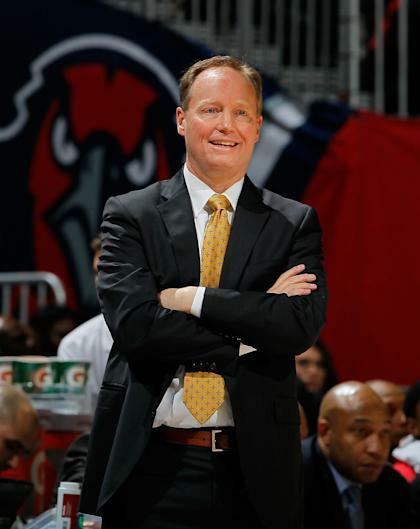 Atlanta Hawks head coach Mike Budenholzer was named the 2014-15 NBA Coach of the Year on Tuesday, earning honors as the league's top bench boss after leading the Hawks to the top of the Eastern Conference thanks to a 22-game increase in the win column over last year's finish that produced a franchise-best record of 60-22. Budenholzer received 67 first-place votes and amassed 513 total "award points" — five points for a first-place vote, three for a second-place nod, one for third-place — from the panel of 130 sportswriters and broadcasters who cast ballots. That was enough to edge out Golden State Warriors head coach Steve Kerr, who received 56 first-place votes and 471 points after leading the Dubs to a 67-15 record — the best mark in the NBA this season, and tied for the sixth-best in league history — in his first year on the bench. Jason Kidd finished third (one first-place vote, 57 points) after leading the Milwaukee Bucks to 41 wins and a playoff berth after finishing with an NBA-worst 15 victories a season ago, before he took the reins from Larry Drew. Boston Celtics coach Brad Stevens (two first-place votes, 50 points) finished fourth after charting a steady course to the postseason for a club whose locker room seemed to feature a revolving door this year, as general manager Danny Ainge churned through a franchise-record 23 players before finding the a mix that would finish the season 24-12 under Stevens' tutelage. Last year's winner, San Antonio Spurs head coach Gregg Popovich, received three first-place votes in finishing fifth. Chicago Bulls head coach Tom Thibodeau received the lone remaining first-place nod. You can check out the full results, including the ballots of all 130 voters, here. Three members of our Yahoo Sports panel — me, Marc J. Spears and Eric Freeman — tabbed Budenholzer as the Coach of the Year in our playoffs-and-awards predictions. Kelly Dwyer and Ben Rohrbach chose Kerr. Budenholzer joined the Hawks before the 2013-14 season after spending 19 years with the Spurs. The Pomona College product, who played and coached professionally in Denmark before returning to the States, began as a video coordinator before moving to the San Antonio bench and developing a reputation as one of the NBA's top assistant coaches, eventually rising to become second-in-command under Popovich, who coached at Pomona and took Budenholzer under his wing. Budenholzer "could ultimately have been [Pop's] successor should he have decided to stay until the future Hall of Fame coach decides to retire," Yahoo Sports NBA columnist Adrian Wojnarowski wrote two summers ago. Instead, he decided to seize the opportunity to strike out on his own in Atlanta, where the Hawks had stagnated under the previous regime led by Drew. After a promising start to the '13-'14 campaign that had them sitting a couple of games above .500 with a top-10 offense, an above-average defense and a top-10 point differential on Christmas Day, big man Al Horford suffered a torn pectoral muscle that cost the Hawks' centerpiece the rest of the season. Working without their primary interior defender and playmaker, Budenholzer doubled down on his preferred spread-it-out-and-fire-away system, having bigs like Paul Millsap, Pero Antic and Mike Scott empty the lane to create interior space for off-ball cuts and dribble penetration. It worked well enough, as the Hawks scuffled to a 38-44 record, good enough to edge the New York Knicks for the No. 8 seed in the Eastern playoff bracket, and to push the top-seeded Indiana Pacers to their breaking point in a seven-game opening-round series. Despite a couple of sound offseason additions — namely the cost-effective acquisitions of defensive-minded swingmen Thabo Sefolosha and Kent Bazemore — and the expected return of Horford, many observers pegged Atlanta for a middle-of-the-pack finish this season. The middling projections came after the Hawks suffered through a chaotic summer that saw part-owner Bruce Levenson express his intention to sell his stake in the Hawks following the revelation of an August 2012 email he wrote to general manager Danny Ferry in which he theorized that "the black crowd [at Philips Arena] scared away the whites and there are simply not enough affluent black fans to build a signficant [sic] [enough] season ticket base" to support the team, among other troubling racially tinged comments. Those comments came to light as part of an as part of an internal investigation into a reference made by Ferry to forward Luol Deng as "having some African in him" during a conference call with ownership and management about prospective free-agent targets, a reference apparently intended to conflate something about Deng with African merchants who sell counterfeit goods. Ferry was later placed on an indefinite leave of absence, with Budenholzer taking over Atlanta's basketball operations department and eventually being named the Hawks' nominee for this season's Executive of the Year voting, despite Budenholzer's objections. Despite all the internecine drama, Budenholzer had big plans for his second go-round in the big chair. "I think we all get more comfortable, probably, going from our first year to our second year," Budenholzer told me during 2015 All-Star Weekend in New York. "You know, maybe you can go a little bit deeper on what you're trying to instill, and the concepts. You can give the players even more freedom, maybe even step back more and take responsibility and take ownership. I think that's the best thing that can happen with our group." The Hawks' players certainly responded to the increased freedom in Budenholzer's read-and-react system, taking advantage of a full year of reps in the ball- and player-movement-reliant offense while showing evidence of trust and continuity in a defensive scheme that demands tight, timely rotations and shared responsibility for stopping opponents. They took the league by storm after Thanksgiving, ripping off a franchise-record 19-game winning streak (the fifth-longest streak in NBA history) behind a balanced attack that earned four Hawks starters — Millsap, Horford, point guard Jeff Teague and sharpshooting guard Kyle Korver — spots on the Eastern All-Star team, and would net the whole starting five (those four plus rugged perimeter player DeMarre Carroll) Eastern Conference Player of the Month honors after an undefeated January. The Hawks ran away and hid from the rest of the East, finishing a full seven games ahead of the Cleveland Cavaliers in the race for the No. 1 overall seed in the conference and earning home-court advantage throughout the Eastern playoffs. They share the ball, finishing second in the league in assists, assist ratio and points created by assist; third in secondary assists and assist opportunities per game; and fifth in passes per game. They scorch the net from long distance, ranking fourth in percentage of total points generated from 3-point land, and second in team accuracy beyond the arc, led by Korver's NBA-best 49.2 percent mark. They hung together on both ends of the floor, ranking sixth in the NBA in points scored per possession and seventh in points allowed per possession, making the Hawks one of four teams to rank in the top 10 in both offensive and defensive efficiency, along with Kerr's Warriors, Popovich's Spurs and Terry Stotts' Portland Trail Blazers. Budenholzer got the collective effort necessary to produce such stalwart two-way work; his players rave about him, praising his ability to walk the line between tactician and team leader without being viewed as a harsh taskmaster. Had the voting gone Kerr's way, in recognition of his work in pushing all the right buttons to elevate the Warriors from a very good 50-win team under Mark Jackson into the ranks of the all-time elite regular-season teams in NBA history, we wouldn't have batted an eye. But this season has been nothing short of a resurrection for the Hawks, and Budenholzer deserves his fair share of the credit for raising the Hawks to heretofore unmatched heights.